Many new readers of Wool are turning pages, rather than flicking screens, as the self-published science fiction dystopia finds a mass market in book stores alongside author Hugh Howey's Amazon success. If you follow Howey on Amazon you are probably well and truly into the Wool prequels, First Shift, Second Shift and Third Shift and waiting for the release of Dust. Meanwhile traditional readers are buying up the Wool omnibus (books one to five) and waiting for the Shift omnibus (books six to eight). If you have managed to continue reading through my compulsive need to tidy up the state of play regarding Wool, let's get down to the story. In a classic dystopian setting, the world has been through a cataclysmic crisis such that the atmosphere is immediately toxic to life and apparently the only living beings on the planet live in a massive buried silo which peeks out just enough above ground to see the devastation. An entire self-contained community exists in the silo and for them, this massive mainly underground structure with a huge staircase down the middle and more than 100 floors, is the world. The grow their own food, produce their own power, even mine their own oil and of course, as we immediately discover, they have their own unusual rituals for delivering justice and keeping the community in tact'. The cleaning is the key point here where people who break the main taboo - wanting out of the silo - are given that (fatal?) opportunity and it involves space suits, wool pads and the large sensors by which the silo catches a glimpse of the outside world. Of course that glimpse raises a tension, as does any view of the world beyond where we are. While many go about their lives content in the patterns of silo existence, some wonder how it came to be and what of the world beyond. In a voice reminiscent of good science fiction, Howey delivers this world to us such that while it may not feel like total immersion, it is close to it and that means readers immediately enjoy getting lost in this other world. With some effort you can pull back and consider is this an analogy for our lives, our world, a coming together of 1984 and Lord of the Flies and so many other dystopian worlds where the spark of the human spirit is drawn bright against the darkness of our decay. The episodic style of the original Kindle series is not disruptive but creates a rhythm of revelation that is in keeping with the story. We begin with a focus on Sheriff Holston, follow the (pilgrims) journey of Mayor Jahnes and deputy Marnes and eventually come to focus on down deep mechanic Juliette and a stargazing Lukas. And of course, in keeping with the real world, the guys in IT believe they really run everything (silos within silos) and so a conflicting view of how things might be and revelations of how they came about keep the reader turning pages eagerly. And let's not forget the somewhat clumsy but appealing romantic plot lines that provide that softer edge of interest that dystopias sometimes need but don't always benefit from. My feeling of the text is that it is clean, precise and sparse, with evidence of growing maturity and complexity, something that was also seen in the preview of Shift available at the end of my copy of Wool. The confidence and vision of the writer had grown and I was ready to keep reading. And so are many millions of others. 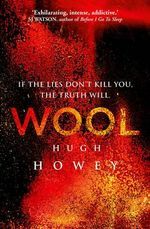 Wool by Hugh Howey, paperback 537 pages plus author Q & A and preview chapters of Shift, published by Century, 2013.